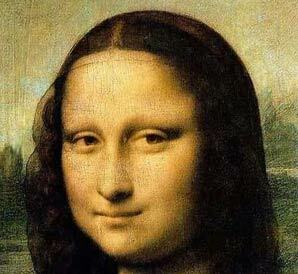 http://www.JewishWorldReview.com | What is the Mona Lisa really thinking? Structurally unremarkable and noticeably unfinished, Da Vinci's most famous masterpiece has intrigued experts and laymen alike. One can spend hours gazing at the mysterious woman, wondering where she is looking, why she is smiling and, perhaps most perplexing, what is it about her that captures our attention and imagination more compellingly than any other portrait. Let's face it: something about her face grabs hold of us and will not let go. But is she real? Or was Leonardo's model merely a foundation on which the artist created that breathtakingly timeless expression from his own inner genius and his painter's pallate? Is the serene and stately woman really a composite, as suggested by the misty and magical world that swirls behind her? Or was she perhaps no more than another pretty face, with little going on behind those enigmatic eyes but an endless recapitulation of the chores that awaited her after the sitting or the grocery list she would have to fill on her way home? We will probably never know. But there is good reason to believe that La Giaconda was in fact a woman every bit as complex and multifarious as her inscrutable expression would have us believe. In his bestselling book Blink: the Power of Thinking Without Thinking, Malcolm Gladwell cites the work of psychologists Silvan Tomkins and Paul Ekman, who mapped the expressions of the human face and identified 43 distinct muscle movements incorporated into facial expressions. Their research has been applied to the study of marriage counseling, schizophrenia, heart disease, and the computer animation that brought us Toy Story and Shrek. Intuitively, we all read minds by reading faces: smiles reveal joy and friendship, frowns show unhappiness and frustration, scowls express disdain and contempt. When understood more precisely, facial expressions can reveal subtleties and nuances of personality and character. When read with training and discernment, the face can uncover deception and deceit which, no matter how expertly, cannot completely sever the connection between inner feelings and outward expression. Conversely, our expressions not only display emotions  they can evoke them. Smiling can improve your mood; creasing your brow can increase anxiety; narrowing your eyes can increase anger. Relaxing the face into an expression of calm can lower your heartbeat and respiration; tensing it into a scowl can have the opposite effect. Fascinating as it is, the research of Tomkins and Ekman comes as little surprise to those well-versed in Jewish tradition. The Hebrew word ponim, meaning "face," also translates as "inside." That the most ancient of all languages should conflate the external appearance of the face with the interior workings of the soul might have baffled scholars through the ages if not for their implicit understanding that the human face is inextricably bound to the human heart. In contrast, the Hebrew word for "garment" is beged, which shares its grammatical root with bogad, meaning "betrayal." We may change our clothing in an attempt to disguise ourselves or adopt an alter ego, but as much as we try to mask our expressions, our inner thoughts and feelings will eventually give us away. King Solomon said as much in his Proverbs: As water reflects one face to another, so too the heart of a man to his fellow. Just as the heart pumps the blood that cycles through the body, similarly will a man's countenance revisit him in the form of the relationships he affects through his outward expression. The inner self becomes public through the face, defining the course of our lives and our place among our fellow men. Perhaps this is why the great sage Shammai taught, "Encounter every person b'saiver ponim yafos … with a pleasant countenance." On the most basic level, we cannot help but feel drawn to others who greet us with a smile and a friendly word. Not only to we bring joy into the world around us, but we make others want to seek out our company and companionship. Beyond the effect we have on others, however, is the more immediate effect we have upon ourselves. As Tomkins and Ekman observed, by acquiring a pleasant countenance we can refashion ourselves into more pleasant individuals. Perhaps this, then, is the secret of the Mona Lisa's smile. With only the most subtle upward twisting of her lips, the mysterious lady has awakened in her own heart the first stirrings of joy and contentment. Captured by the artist's brushstrokes, her gentle expression has become iconic by transcending time, bringing the wisdom of the ancients forward into the contemporary era by reminding us of the power of a look, a glance, or a smile. In a generation in which we have become increasing adept and concealing our identities and severing all but the most superficial connections to one another, it's reassuring to recall how easy it can be to restore our relationships. With one little smile we can truly change ourselves, and change the world.